A life as dedicated to beauty, to artistry, to the selfless service of others as Eric Rosenblith’s, must surely be pleasing in God’s sight. Eric’s life is now complete. Yet, of how many 90-year olds can one say at their passing: “too soon!” It took me greatly by surprise. Of all the people I have known, he's the one that I was certain would live forever. It’s still impossible to imagine that he’s gone. His voice, his moods and gestures and expressions, his music-making, are all so deeply ingrained in my memory — I don't think there is anyone in my experience who is so easy to call up before the mind's eye and ear: the way he would peer over his glasses and shake his head, his delight in telling stories, his way of pronouncing “fingers,” which always called to mind a verb — “to fing.” Bundled up against the cold, with his beret and his violin case —walking out onto the Jordan Hall stage next to Gabriel Chodos... think of him, and he is there. I see him as he played — how he danced; how he lifted himself off the floor. The astounding ease and elegance of his bowing, which he retained to the very end of his life. I picture him as I first knew him, in 1970, in recital with Victor Rosenbaum, or David Hagan, or Blanche Winogron. Every recital featured a page-turning disaster. We waited for them. His parts in those days looked like advent calendars, with little flaps and turn-outs, and his page-turning skills didn’t quite match his musical ones. 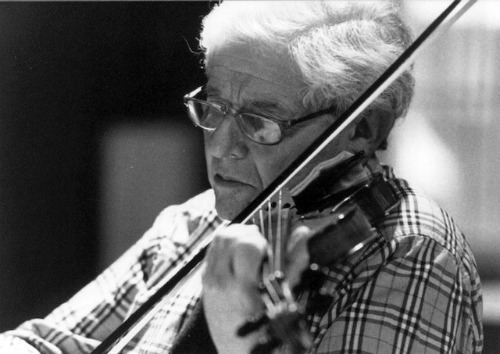 He was a brilliant violinist — but it was as a musician that we prized him. His imagination was endless; his buoyant energy infectious. Every phrase was colored and shaped, and delivered with the greatest sincerity and enthusiasm. I knew the first time I heard him that I had to be his pupil. I picture him as a middle-aged man, with dark hair — with a young wife and a young son, and a new lease on life after having lived through horror and heartbreak such as few of us can imagine. — One winter day, one of my fellow students interrupted our lesson — in tears because he had slipped on the ice outside the building, and broken his violin. Eric said: "It's a thing — get it fixed." I thought that was rather unfeeling of him, and that he might not feel the same about his Strad — until later that day I was told of the accident that had changed his life. Eric was right, of course: things can be fixed. I remember the joy with which Paul Doktor received the, by then old, news that Eric had remarried. He was excited for Eric, and said he hoped that marrying Carol would bring him a new, bright future. Paul’s wish came true. We have all witnessed how Eric loved Carol and depended on her. Carol’s love was his salvation — her youth his renewal — her joyful spirit his joy. And Alan was a such a blessing to him. I remember one day at the Rosenblith’s house when little Alan was misbehaving — Eric picked him up, tossed him in the air, making him giggle, and said, laughing: “No Alan! No, no no!” Seeing that, I thought: “I wonder what will become of that kid. He’ll be spoiled for sure.” I needn’t have wondered. Alan, your father was so proud of you, and of your accomplishments. There was never anyone more dedicated to the art of teaching, and as a teacher, Eric had few peers. He had the benefit of great teaching himself, and he always spoke with the greatest authority. He studied with Thibaud and Hubermann, and was coached by Enesco. He matured in the elite circle of Carl Flesch’s studio. Those of us who studied with Eric were conscious of that important legacy. Many of Eric’s scores, which he lent to his students, had Flesch’s hand-written annotations in them. We often worked from Flesch’s editions, and, of course, the Scale System. That could be a little intimidating for us mere mortals. I believe it was Cyrus Stevens who once responded to Eric in class: “the spirit is willing, but the Flesch is weak.” It seemed to me that Eric also felt the weight of that legacy. Once, in a lesson, he changed one of Flesch’s fingerings in my part, and I saw him give a furtive look heavenward, as if about to be struck by lightning. He revered Flesch, and in his later years spoke with typical erudition about Flesch’s teaching, which was the model for his own. His translation of Flesch’s Art of Violin Playing is an important contribution to the literature of the profession, as is his own book, “Ah, You Play the Violin …”: Thoughts Along the Path to Musical Artistry. Eric was a formidable intellectual. He said he was lazy when he was young — and laughed to recall what his first teacher once said to him: “Eric, if you would only practice, I would be famous.” Perhaps it wasn’t laziness. Eric was bored by routine. He told me he always rather envied his scientist brother, who was always learning new things, while he had to practice the same old scales and etudes. Eric’s mental world was large. His teaching was full of marvelous imagery. He taught us to practice through invention and variation, and to bring all of life’s experience to bear on our artistry. “We truly need to be thinkers, poets, painters, engineers, and philosophers,’’ he wrote in his book. He was all of those things, and more. Eric could be authoritarian in his way, and woe to you if he ever got angry with you. But he was sympathetic to his students’ vulnerabilities, and was very patient with their limitations. In lessons, he would cushion his criticisms in elaborate courtesies, so as not to wound tender sensibilities. He treated his students with such grace and respect and old-world charm… — I always left my lessons with a sense of being connected through him to a great tradition that reveals the violin as an instrument, not just of sound, but of civilization — a sophisticated means of raising us above the mundane, of educating the mind and body and spirit all together and transporting us in moments of inspiration and success to a higher level of being. He surely knew, because I told him often, that the hours I spent with him, in lessons, and just being together, are among the most cherished of my life. He had many students, and I’m sure we all feel the same. How fortunate I was to have been his pupil. He always knew just what to do to heal where it hurt, to unlock whatever difficulty, musical or otherwise, I may have had, and to demonstrate in very practical terms that what seemed unreachable was indeed possible. In later years, I learned to know him in a different way — delighting in his company; hearing him tell funny stories, like the time Fabien Sevitzky, the conductor of the Indianapolis Symphony (and not a native speaker), introduced an audience of schoolchildren to that great musical classic, "Siegfried's Fahrt on the Rhine;" enjoying, as I always did, his music-making; or simply marveling at his great, unquenchable energy and love of life. I have great sadness — but also the warmest feelings of love and gratitude for Eric. In recent years, I didn’t see him often — nevertheless, I miss him immensely. It was always such a comfort just to know that he was in the world — that someone of his intelligence and culture was in the world, like you're glad the Louvre is there, or the Vienna Opera House... but in his case, it was of course personal — and I am so grateful for the immense privilege of having basked for a while in the light of his attention, and having learned from his teaching and his example that humanity can indeed be redeemed through intelligence, art, self-sacrifice, generosity and love. On October 2, 2011, Eric Rosenblith's students and friends gathered in Boston to celebrate his life in music and words. Thank you so much for such a beautiful and moving remembrance of Mr. Eric Rosenblith. What a lovely tribute to him. Well done.